The purple beard says it all. Ask anyone in the town of Arroyo Grande if they know Devin Ward, and the answer is most likely to be yes. If someone doesn’t know him personally, they share that they have certainly seen him around this picturesque Central California coastal town. Always colorful and hard to miss with his beloved Cockatoo Fiona perched over his shoulder, each spring he is like a blooming flower as his beard becomes a vibrant purple. Born and raised in rural, central Pennsylvania farm country in a small town called Mifflinburg, Devin always felt a personal calling to travel the world. He lived, worked and studied abroad in Germany and Japan for 15 years before settling in the small town of Arroyo Grande, CA in 2000. Upon arrival in California, Devin immediately pursued his California teaching credential and was employed as a first and second-grade teacher in Santa Maria Bonita School District until his diagnosis of ALS in 2015. He shared that discovering the disease took the doctor a long time and with it came discomfort and multiple symptoms. After his diagnosis, Devin traveled to back to Germany and Japan. He continued his adventures exploring Colombia, Costa Rica, Thailand, and Cambodia. “While I was still able to walk, I wanted to enjoy myself,” Devin shared. He was drawn back to his Arroyo Grande community and registered for services with The ALS Association Golden West Chapter. Devin also made a commitment to raise funds and awareness for ALS when he learned about the San Luis Obispo Walk to Defeat ALS. 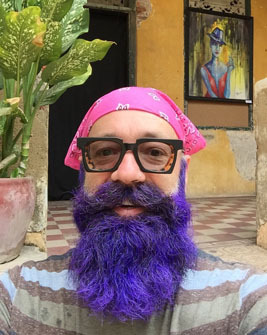 Devin’s signature purple beard came about when his niece, Zoe Donohue, begged him to let her dye it. Little did he realize, the purple beard would serve as a symbol in his quest to raise awareness and funding for ALS. 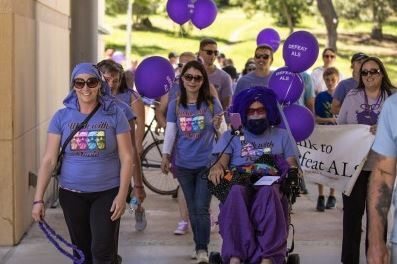 Determined to make a difference, Devin, along with his family and friends, participated in the San Luis Obispo Walk to Defeat ALS as “Devin’s Defeaters” in 2016 where he inspired the crowd with his incredible story. Devin not only led the force of Devin’s Defeaters fundraising success but was also the heart of the huge circle of friends and family who came out to the San Luis Obispo Walk to support him and the ALS community -- some of whom traveled far for the event. 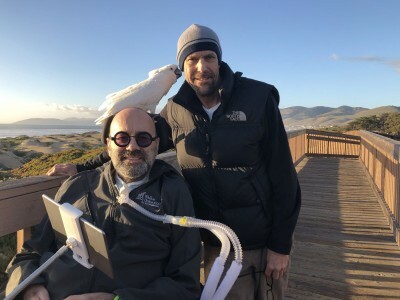 Along with his commitment to fighting ALS, Devin has become an outspoken advocate for the use of medical marijuana in Arroyo Grande, which was banned by the city council in January of 2016. Shortly after the ban, Devin gave a moving testimony to the Arroyo Grande City Council and brought tears to the eyes of some council members, according to an article in “The Tribune”, San Luis Obispo, California. Devin and other advocates were crucial in the council voting on a new ordinance that banned most commercial medical marijuana land use, like dispensaries and outdoor cultivation, but allowed personal indoor cultivation, and more importantly for homebound patients like Ward, allowed the city to issue up to three permits for mobile delivery businesses. Devin also participated as an ALS advocate in 2018 at the ALS Association's annual National ALS Advocacy Conference in Washington DC. While there, Devin met with representatives from Senator Diane Feinstein's office and offered moving testimony about the challenges he has faced while living with ALS. Although he now calls California his home, he still has deep ties with the community where he grew up. The area newspaper of the Central Susquehanna Valley, “The Daily Item” has written numerous articles in support of Devin. His friends and family have donated to his Walk team and even traveled to participate in the SLO walk over the last three years. Since 2016, his team has raised over $80,000 in support of the mission of The ALS Association Golden West Chapter. In 2019 The ALS Association Golden West Chapter honored Devin Ward with the inaugural San Luis Obispo Walk Hero Award at the 8th annual San Luis Obispo Walk to Defeat ALS. The award is presented to an individual who is making courageous and inspirational efforts in the areas of advocacy, fundraising, and public awareness while living with ALS. Devin is deeply committed to supporting the search for effective treatments and cures for ALS. 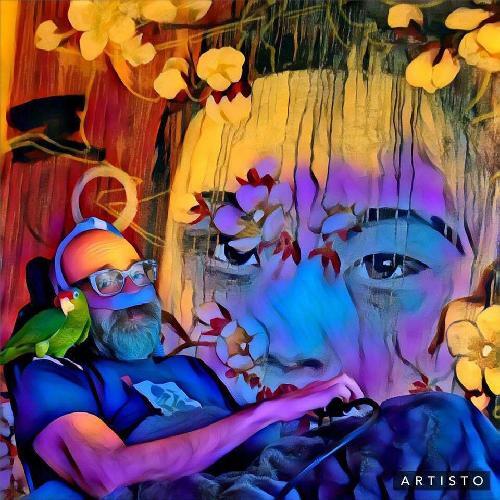 He dedicates time to educating others about ALS, through community events, news interviews, and an active social media presence to raise awareness and support for the ALS community. With a ventilator and a tracheostomy, he can no longer eat, walk or talk. Although he is limited physically, he is still able to type on an iPad to communicate with people in person and via email. Ward tries to maintain a positive outlook and remains hopeful for future treatments. He is very much inspired by and grateful for family, friends, neighbors, former students, and even strangers who continue to love and support him. The ALS Assocation Golden West Chapter is moved and grateful for Devin’s creative and effective efforts in raising awareness of ALS, as well as funding for care services for those affected by ALS, for moving research forward towards effective treatments and cures, and for serving as a powerful and colorful advocate on behelf of the ALS community.